Smoke plume from burning drill rig; note oil slick at lower right. Image courtesy MSNBC; see their slideshow. 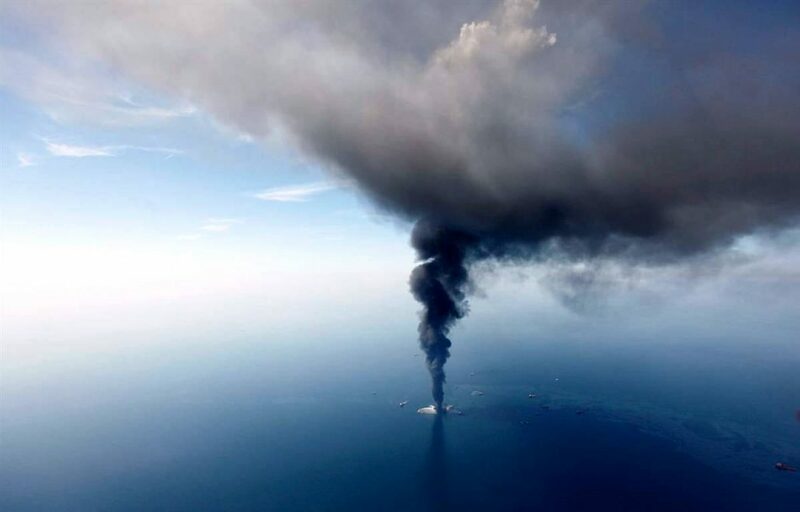 Firefighters working to control blaze at the Deepwater Horizon drilling rig in the Gulf of Mexico. Photograph courtesy of Rigzone. See more hi-res Coast Guard photos in SkyTruth gallery. We’ve just begun seeing news reports of an explosion and fire last night that has forced the evacuation of 126 workers from an oil rig that was drilling an exploration well 41 miles off the Louisiana coast in the Gulf of Mexico. 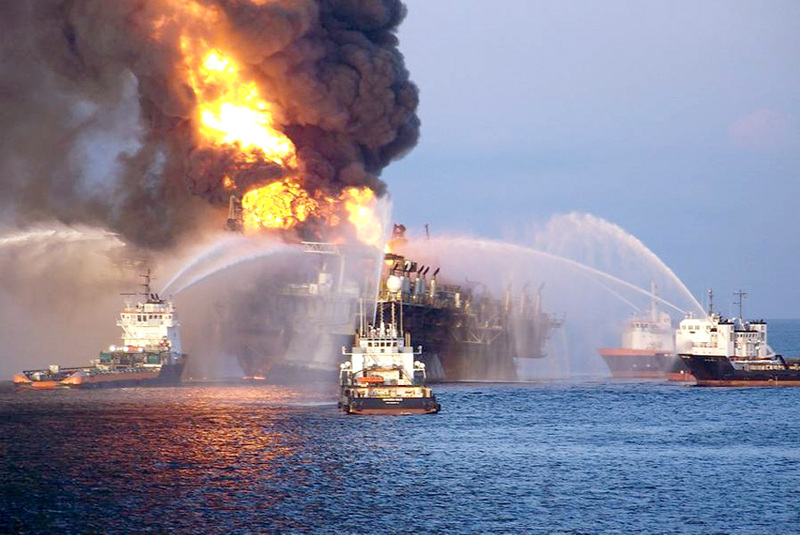 The Deepwater Horizon is a massive semisubmersible drill rig built in 2001. It’s owned and operated by Transocean Ltd, the world’s largest offshore drilling contractor, with a global fleet of more than 140 rigs. 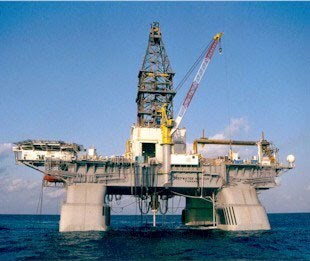 Transocean operates 14 rigs in the Gulf of Mexico. 11 workers are missing and 7 have been injured. The rig is still on fire (video of fire and evacuation of crew), and is listing. The Deepwater Horizon semisubmersible offshore drilling rig. The rig was built for drilling ultradeep wells in water far offshore, where most of the action is in the Gulf of Mexico. It’s under contract to BP and was drilling an exploration well in the Macondo prospect, in the Mississippi Canyon area of the north-central Gulf. The water depth there is almost 5,000 feet. SkyTruth’s testimony to Congress last fall on the risks of offshore drilling was brushed off by some politicians. Maybe it’s worth looking at again. UPDATE 4/21/2010 – Despite some reports to the contrary, Coast Guard says 12 workers are still missing. 15 were injured, 7 of them critically. UPDATE 4/21/2010 – NOAA reports that nearly 1.2 million gallons of fuel oil are on the rig (#2 fuel oil or diesel), and that the Coast Guard has requested NOAA’s help in modeling oil spill trajectories in the event of a spill. I’m guessing that much of this oil is burning. See the official NOAA Incident Report. Thanks to blogger Seth Platt for the heads up. UPDATE 4/21/2010, 7:10 pm – NBC Nightly News just reported that the rig is leaking oil into the water; and that the Coast Guard is trying to get an ROV or submersible that can shut off an underwater valve to cut the flow of fuel to the fire. This sounds like a “loss of well control,” or blowout, like the one that lead to disaster off Australia last year. Let’s hope they can get that valve closed. No word yet on the missing workers. 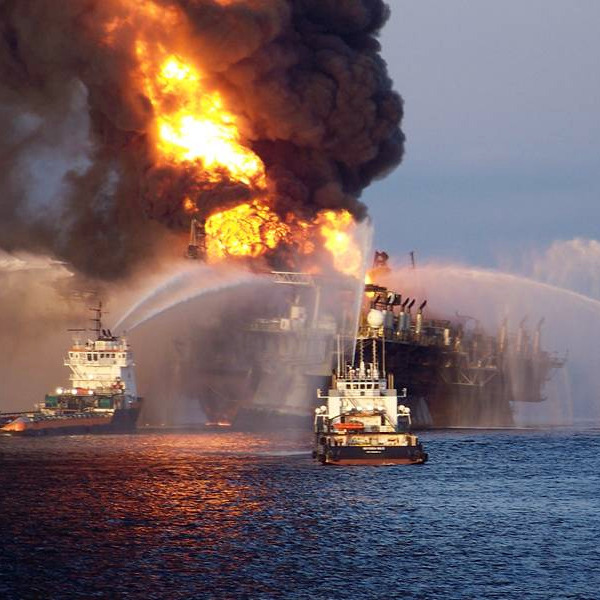 UPDATE 4/22/2010, 9:30 am – Coast Guard still searching for 11 missing rig workers; rig is still on fire. SkyTruth has started an image gallery for this incident that includes hi-res Coast Guard photos of the burning rig. UPDATE 4/22/2010, 2:00 pm – CNN is reporting that the rig has sunk. The fire is continuing. Coast Guard is estimating that oil is spilling at a rate of 336,000 gallons (8,000 barrels) per day. 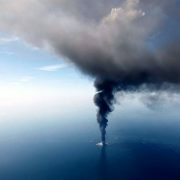 UPDATE 4/22/2010, 5:30 pm – SkyTruth analysis of two NASA satellite images taken hours apart yesterday suggests the Deepwater Horizon rig may have been drifting. Images show the rig moved almost 2-1/2 miles to the east in about 2 hours. We have no confirmation that the rig was drifting, and this would suggest a pretty fast clip. But the shorelines in the two images match up almost perfectly, so we have no exlanation yet for this apparent movement. UPDATE 4/23/2010, 10 am – 11 rig workers still missing and Coast Guard reports that oil is no longer leaking from the damaged well on the seafloor. Not yet clear if this is because their attempt to shut off the well using an ROV has succeeded. Oil spill cleanup operations are proceeding with deployment of containment booms and skimmer vessels.